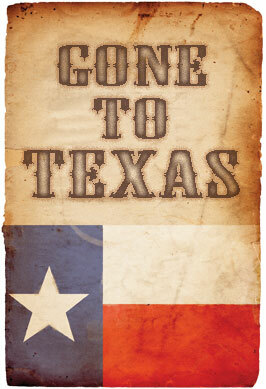 In the 1800’s it was not uncommon to see a sign that said “GTT”… ie – “Gone to Texas”. Since the start the state has been a land of opportunity. It still is. Successful businessmen do not become so by swimming upstream when they can make a location adjustment to where the current is flowing the direction they want to go. Be sure to tell Feinstein, Boxer and Jerry Brown adios on your way out. Here’s the Facebook announcement. Don’t worry, girls, we’re just strengthening your voter base. [We won’t raid your cache of welfare recipients.] As for your tax base, hey, welcome to capitalism. If you screw with ’em, they’ll vote with their feet. Yep, about covers it huh? At the rate Cuomo is going in NY, Remington Arms is going to get tired of the abuse and move to a more hospitable clime as well… and in Connecticut, Colt might find the southern US a little less frosty in more ways than one, too. Also… next… Magpul is most likely going to exit Colorado, as their legislature just passed onerous laws aimed at gun manufacturers. The socialist / nanny states will eventually be left with nothing but their over-controlling “leaders” (I use that term loosely) and the people that expect them to give handouts from someone else’s production. The producers they’ve been milking for taxes while abusing will not stick around like battered wives indefinitely. .
Hey Rob, I need a job, too. Could I be your running mate? I think I feel a case of the runs coming on as I type. Like all political campaigns, we have an extremely careful and scientific vetting process. Just write your name and phone number clearly and legibly on the back of a twenty dollar bill. The drawing will be held just before the election.